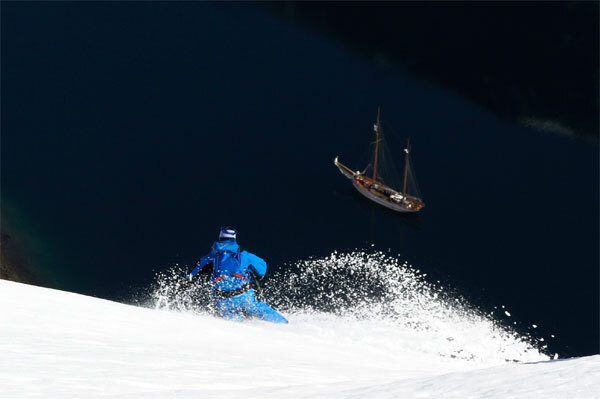 It might be all over for riding in the Alps but, as they say, it's always winter somewhere - and always someone to take advantage of it on skis or snowboard - and, also, with the aid of boat or kite. 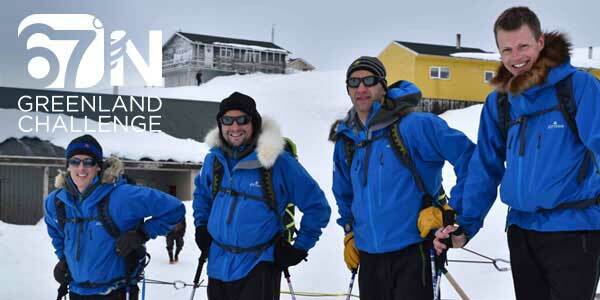 The 67°N Greenland Challenge expedition flew across Greenland and smashed the world record for crossing coast to coast. The previous world record was set in 2008 and was just short of 18 days. Tom and his crew (Team 67°N) accomplished this feat in an astonishing 9 days, 19 hours and 40 minutes, nearly half the previous record. It wasn't all plain sailing - or kiting. Kiting in strong winds, over sastrugi (corrugated) snow and in extreme cold was no picnic. The final walk across 55km to the ocean was beautiful, teaming with wild life but also painful, especially for one of the team with frostbitten toes through kiting at night. Catch the final euphoric day's blog from Tom Avery, here. IT'S DAY FOUR for our three men in a boat, Jes, Andy and Tim set sail from Alta, North of the Arctic Circle for a spring touring adventure via boat in Norway. On the first day's tour they scored 30cms of fresh. And that's all we know for now because they have no signal. We'll bring you any updates we receive - and a full report when they return. IT'S DAY ONE for our three men in a boat, Jes, Andy and Tim who have just arrived in Alta, North of the Arctic Circle for a spring touring adventure via boat in Norway. As one of these three intrepid travellers once turned up at an airport with his wife's passport instead of his own, and another arrived at a resort after a three hour transfer to realise he had left his snowboard on the luggage trolley at Arrivals, actually getting to the harbour in Alta together with all their kit was an epic achievement on a par with hucking Colbert's Couloir in a white out. As usual, there's always a story to be had when you're travelling in a group. No it wasn't Andy's usual last minute airport arrival at Gatwick but at the other end of the flight into Oslo. To cut a long story short, fortunately, Andy decided to get his passport out and ready before disembarking the aircraft and this is where the story began. As the plane emptied with passengers filing past our row of seats Andy's searching got more and more animated with worried look replacing the usual casual attitude Andy adopts when travelling. Eventually, the passport was found, underneath the seats of the row behind where we sat. However, this is not the end of the story; he needed his boarding passes, one with the luggage receipts as well as the pre-printed one for the next leg of the journey. The reason for this only became apparent when he explained to us that he'd understood his luggage was checked in for Tromso. With barely an hour between landing at Oslo and taking off for the flight to Alta, our time at Oslo was fully employed with getting from one plane to another. Firstly, all our luggage came off the conveyor belt (including Andy's). This surprised me as I'd understood mine was checked through to Alta and that was where I'd be seeing it next. Secondly, Andy was able to reprint the boarding pass. Eventually we made it to Alta, with a brief stop at Tromso around 10:30 pm. It was dull, windy and overcast but no sign of darkness pending. A quick taxi to our hotel in the midst of a town that makes Milton Keynes look "characterful" and we were off out in search of food and a quick beer. We failed on the first challenge rejecting a kebab van as this was the only offering available. However, we did have a couple of beers in a small bar with a more than half decent band playing. It was a short stroll back to the hotel after midnight - and it was clear that the night sky was not going to feature darkness anytime soon. It was still daylight. Tim and I shared a more than adequate twin room, while Andy appeared to have come up trumps with a choice of five beds and two bathrooms in his 'room' due to an unlocked interconnecting door! Breakfast has been plentiful with the expected trays of fish, etc. Tim's comment 'how often do you have caviar for breakfast?' says it all! Currently waiting for the rest of the party and transfer to the boat. 'Well, I'm pleased to report we got through last night's storm unscathed, although we have not moved. It was seriously noisey, with snow pounding our little sanctuaries relentlessly. By morning, drifts had built around our two tents so deep that we had to dig ourselves out just to be able to open the tent doors! 'The wind continues to howl, although not with the same intensity as last night and the sun is trying its best to break through the current groundstorm of windblown snow. So we're whiling away the time playing cards and melting snow to fill up water bottles. With any luck the breeze will calm down this evening and enable us to get some nighttime kiting in. 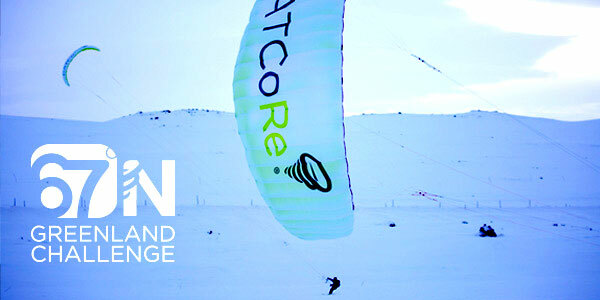 The team, whose sponsors include Jottnar, the extreme mountain clothing brand created by ex Royal Marines, are using snow kites for extra speed, often crossing the snow at night when the winds have been strongest. But last night's storm is just one of the hazards of the trip facing the UK team, comprising Tom Avery, Andrew Gerber, George Wells and Patrick Woodhead. The current record for a coast-to-coast crossing of Greenland was set in 2008 and is 17 days, 21 hours and 30 minutes achieved by Patrick Peters and Matt Spenceley, a Luxembourg/British pair.